Hello! 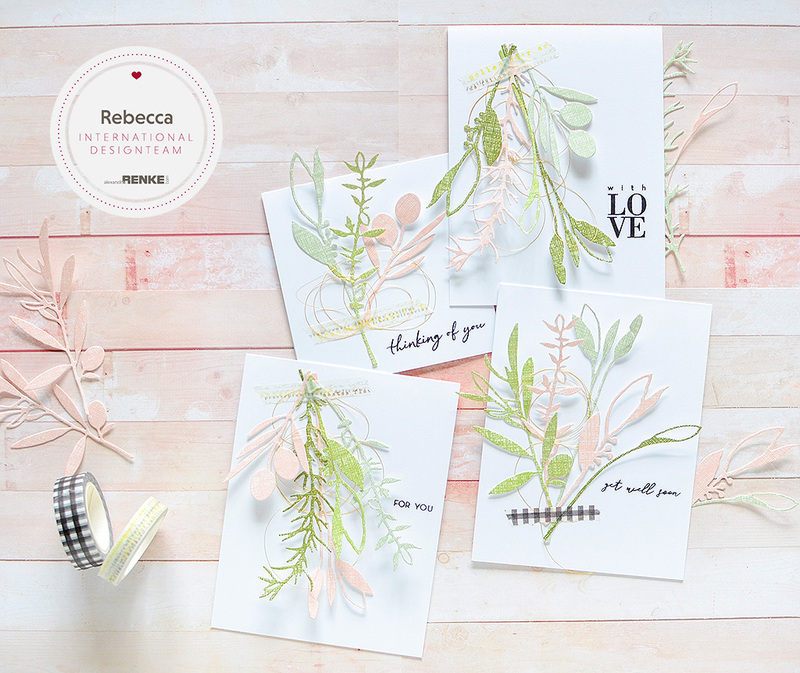 I'm very excited to share that I've joined the Alexandra Renke International Design Team! 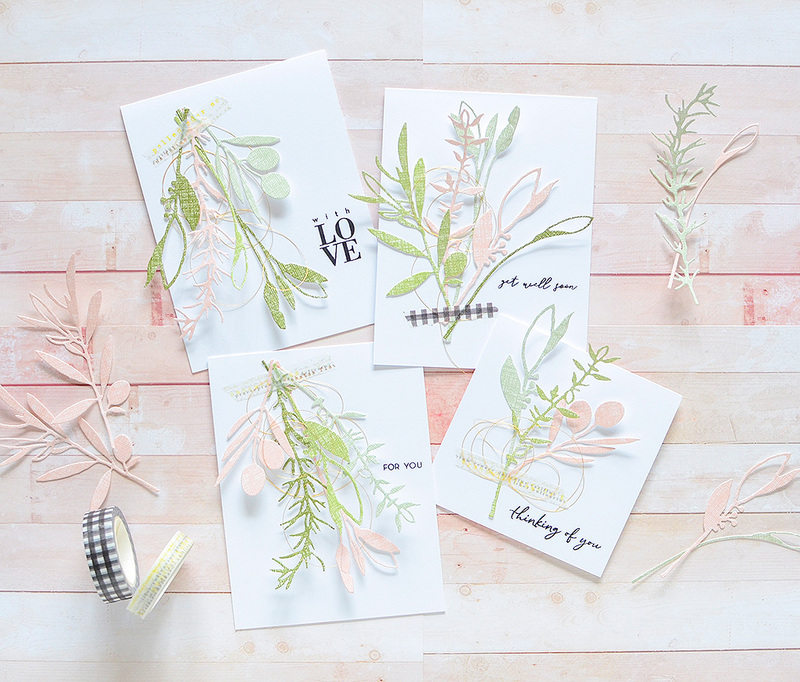 This is such an honor--Alexandra's work is absolutely stunning--gorgeous watercolors and a wealth of beautiful products like 12x12 patterned papers, stamps, dies, and boy oh boy, the loveliest washi tapes. She has an entire team of amazing designers from her country, Germany, and they've welcomed 3 internationals to the team so this is, like I said, a huge honor! Today, both the Alexandra Renke National and International teams are joining together for a Welcoming Blog Hop to introduce the new Int'l members (that would me, Pili, whose blog you may have been visiting before you reached mine, and Rikki, who's up next). I've included the lineup at the end of my post so please be sure to stop by each of the blogs and check out all of their fantastic projects! 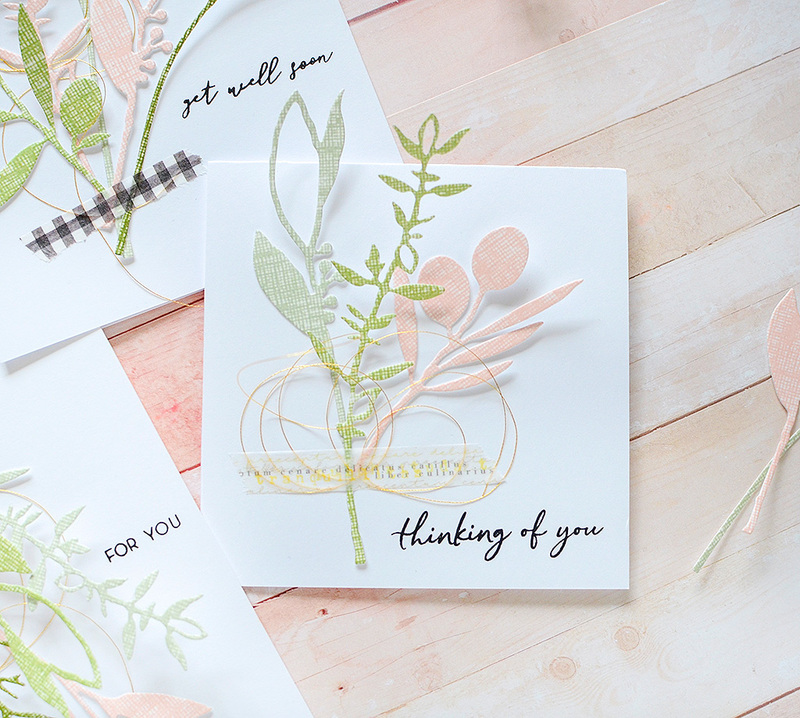 I made a quartet of cards, deciding to use the herbs and olives dies to create some bouquets. 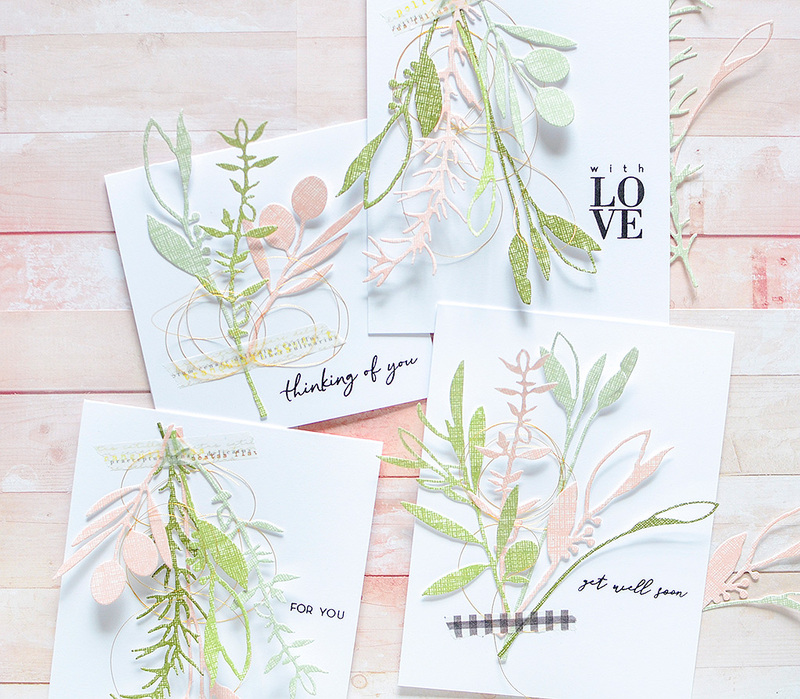 Each card is similar, and I've cut the dies out of the 'Linen' papers in shades of greens and pink. To each bundle, I added a wisp of metallic gold thread and secured them all to the card base with washi tape. 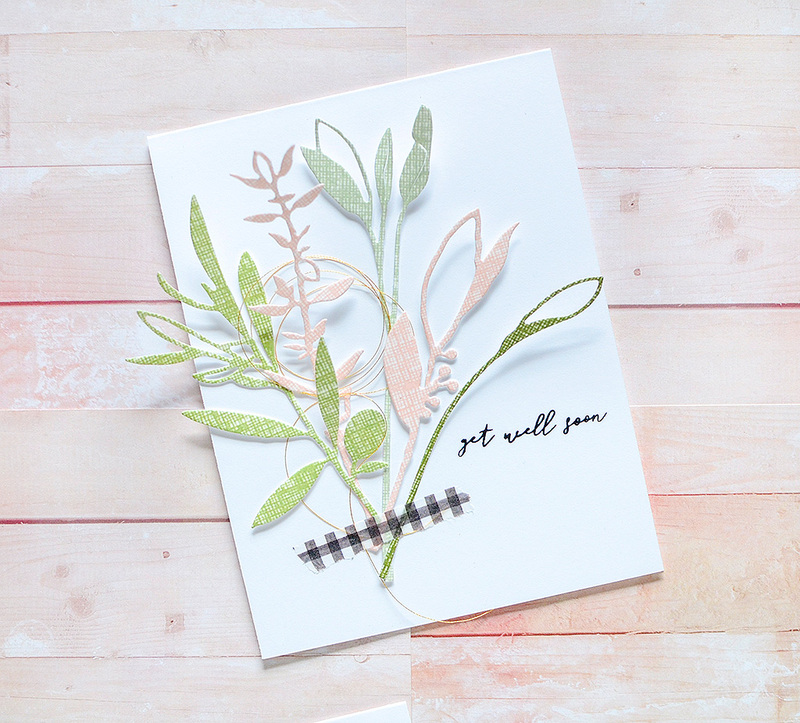 These stems include Rosemary & Thyme, Olive Branches, and Laurel & Sage dies and I used the Lemon Typo tape. The 'For you' stamp can be found in the Homemade To Go set. 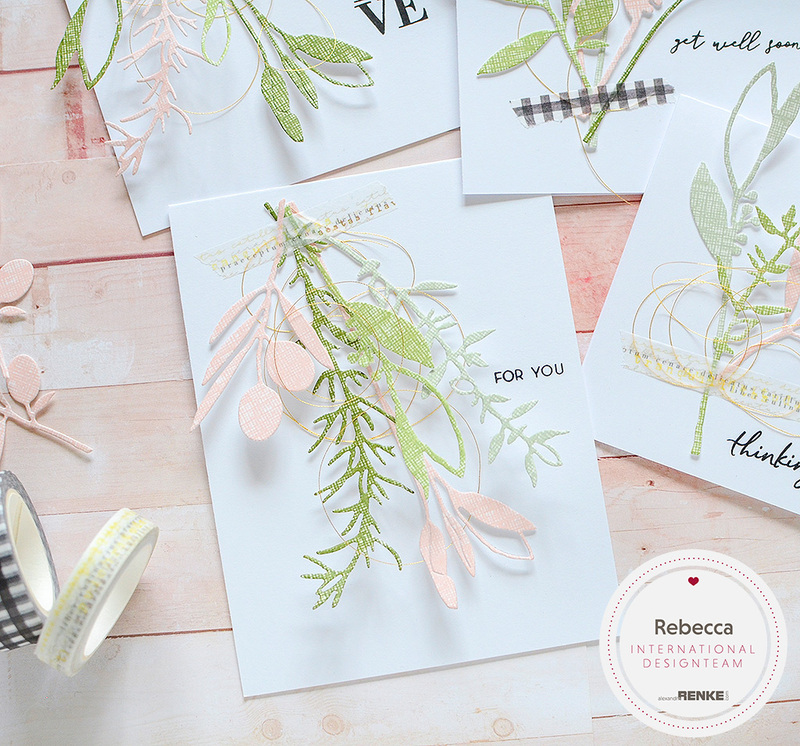 Being that all the cards in my set are delicate, I chose a simple stamped sentiment to put on each one for a clean, minimal look. Next, I used the same dies but the arrangement is slightly different and instead of the bundle hanging down, it's upright like a bouquet. I used different tape this time, too--the Tiffi Square Black--and I tore the strip down the middle in order to have a thinner piece. 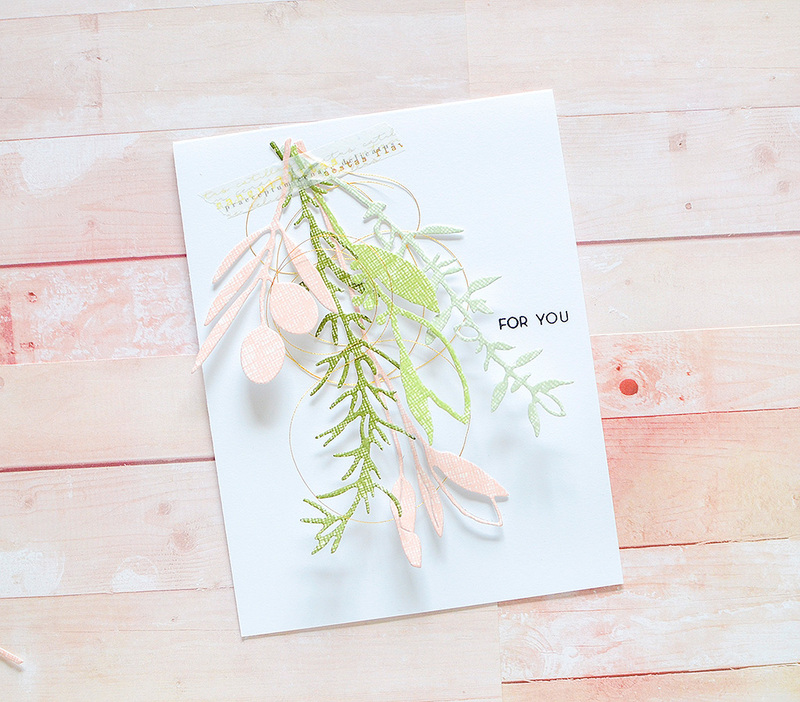 Here's another card with the down-hanging stems. 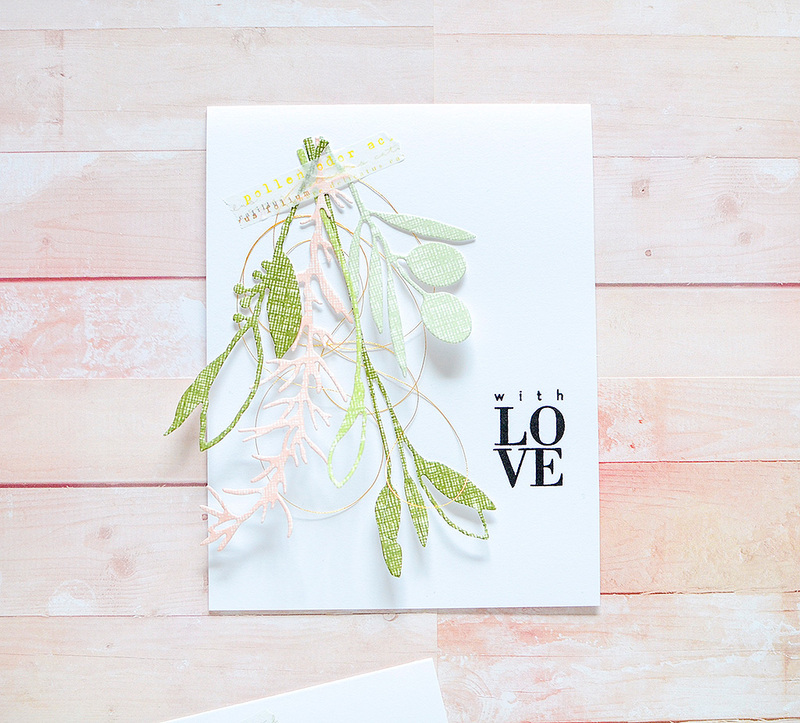 You can find this awesome 'With Love' stamp also in the Homemade To Go set. My last card strays from the long, tall 4.25" x 5.5" size and is a stout 4" square card. I chose fewer die cuts to use on it, and am really happy with the simple trio of branches. 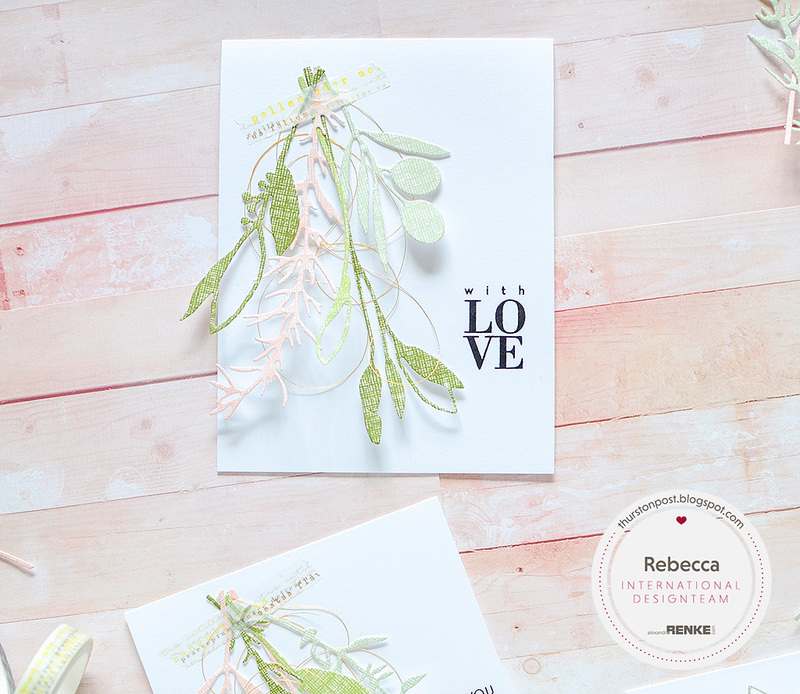 I hope you enjoyed my first projects as a member of the Alexandra Renke International Design Team! There is so much more in store for you today as you travel around the internet during this blog tour. And be sure to check out Alexandra's website and online shop to see this entire new collection--it's all about cooking, baking, grilling, and being in the kitchen (plus a few other versatile pieces) so if you love to cook, or know someone who does, this line is perfection! I can't wait to use it all! Thanks for stopping by today; I'll leave you with the whole Blog Hop list so you can check out ALL the amazing inspiration! Rikki is up next so be sure to say 'hi' and 'welcome'! These cards are amazing. Love the clean look and the combination of papers and dies you used. Love these simple and elegant cards. I just with her products weren’t so expensive here.